Thermodynamics is the study of energy, where energy is viewed as the ability to cause a change. The name thermodynamics stems for the Greek words therme meaning heat and dynamics meaning power, which represents the early efforts of converting heat into power. Today, thermodynamics is the study of all aspects of energy transformation, which includes power generation, refrigeration, as wells as relationships between the property of matter. One of the most fundamental laws of nature is the conservation of energy principle. What the conservation of energy states is that during an interaction, energy can change from one form to another, but the total amount of energy must remain the same. In other words, energy cannot be created or destroyed instead it can only change forms. For example, if you are holding a ball off the ground by a distance h, the ball has a potential energy of the height times the balls mass times the gravitational constant of the earth (E =mgh). Now, if you drop that ball, the potential energy is converted to kinetic energy, where kinetic energy is ½ times the mass of ball times the velocity squared (E = 1/2mv2). 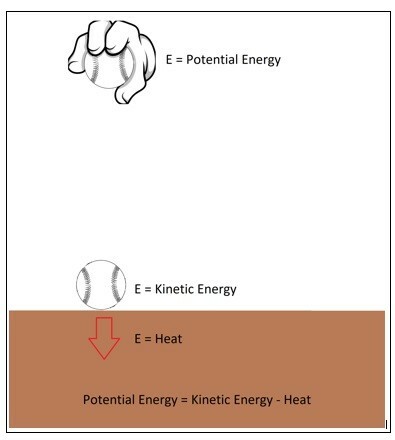 Once the ball hits the ground all of the potential energy would transform to kinetic energy, where the kinetic energy would equal the initial potential energy. This does not take in consideration energy that has transformed into heat due to friction, air drag, and from the ball impacting the floor. In those cases the energy is transformed into heat, and could be considered lost energy. This is the reason why the ball will not bounce back to its original height after hitting the floor, and why, if left alone, it will stop bouncing. Remember, this lost energy was not destroyed, it was just transformed into a different form of energy that isn’t usable. There are two laws of thermodynamics. They are the following. The first law of thermodynamics is an expression of the conservation of energy principle where it states that energy is a thermodynamics property. The second law of thermodynamics states that energy has quality as well as quantity, where the process occurs in a direction of decreasing quality of energy. An example of this would be if you had left a hot plate of food on the table. That plate of food will eventually cool to room temperature. It will not, however, return to its original temperature by itself. The higher temperature of the plate of food degraded as it was transferred to the surrounding room temperature air. In nature all activities where there is an interaction between matter energy, will have relation to thermodynamics. You’re heart pumping the blood inside your body and the energy conservation trillion of cells in your body can all be described by thermodynamics. As a matter of fact the formation of the universe can be described by thermodynamics. In fact if the laws of thermodynamics were to stop working, the whole universe would essentially die. As an engineer, we seek to find a way to use the laws of thermodynamics to transform energy into some form of work. This is done inside power plants to create the electricity that powers your house. Thermodynamics is also used to design your car’s engine. It is also used to cool your food in your refrigerator, or to cool or heat your house with a heat pump. These are just a few examples of applications that use thermodynamics within their design, there are in fact many more, which will be discussed later on.